Trade deficits or surpluses aren’t bad. Nor are they good. They are a natural characteristic of post-barter economies that have achieved division of labor… a sign of success, in other words. For certain countries, there are times when trade deficits simply don’t make a difference. And then there are times when they can be devastating. It all depends on the current account surplus, a concept we will deal with below, and/or whether the country’s currency has reserve status. It’s not hard to understand, so let’s dive in. President Trump seems to think the country with a trade deficit automatically “loses” to the one with a surplus. I suspect that comes from how he ran his businesses and his understanding of debt, but the two don’t equate, and until he understands that we are going to be talking about silly concepts like trade wars and tariffs. I wish his advisors would educate him on this. One thing readers seem to appreciate in my writings is that I try to make complex information simple. Today, I will try to make an already-simple thing even simpler. First, simply using the word “deficit” in conjunction with trade sounds bad to the vast majority of people. We all know that a deficit in our personal finances, meaning we spend more than we make, is bad. And so we equate that kind of deficit with the concept of a trade deficit. It makes a great political theme and wonderful demagoguery. Trade deficits and populism have gone together for centuries. Let’s pause here and define our terms. A trade deficit occurs when Nation X purchases more goods and services (by value) from Nation Y than Y purchases from X. In this example, X has a trade deficit with Y and Y has an identical trade surplus with X. And that works for every other country that we run a trade deficit with or trade surplus with. We buy their goods, they take our dollars. That’s not bad. In fact, it’s arguably better for the US side because China (and everyone else) accepts our currency as payment, instead of demanding we obtain renminbi to pay the bill. The US can do that because we have the world’s reserve currency. It is what French finance minister (and later president) Valéry Giscard d'Estaing disparagingly called an “exorbitant privilege” in the 1960s when France demanded gold for its dollars. That led Nixon to close the gold window and ended the Bretton Woods system. It seemed dramatic but the dollar was still the world’s reserve currency. Everyone still wanted it. D’Estaing and his boss de Gaulle were right: Being the world’s reserve currency IS an exorbitant privilege. One can argue of late that Japan has had similar privileges. Europe and the eurozone and even to some extent the UK have it, too, not to the extent of the US but for basically the same reasons. They also have offsetting current account surpluses, which means money is flowing back into their countries. This goes back to David Ricardo’s “comparative advantage” doctrine he espoused in 1817. Like people, nations have both talent and weaknesses. Everyone is better off if we all do the things we do best. If China can produce something at a lower cost than we can produce it ourselves, then both countries win if we let them do it. Admittedly, problems emerge when relative advantages change. Maybe your country is really good at producing a certain product that a new imported technology renders obsolete. That’s not good for the workers whose jobs disappear, even though consumers now have access to a better product at a lower price. But, that’s not a reason for tariffs or protective measures. It simply means the importing country needs to get those workers retrained and help them transition to different work. Now we will review some simple mathematics. Almost every economist in the world accepts this basic Gross Domestic Product equation: Y = C + I + G + (X – M). This is where Y is GDP, C stands for consumption, I stands for investments, G stands for government expenditures and (X – M) stands for exports minus imports. This is called an accounting identity. In the same way that 2+2 = 4, an accounting identity is always and everywhere true. If your goal is to reduce or eliminate the US trade deficit with China (or anyone else), are tariffs a good tool to do it? No, because tariffs don’t affect the underlying causes. Trade deficits exist not because the US imports too much, but because Americans consume too much and save too little. In national income accounting, the following identity can be derived. It is the key to understanding the trade deficit. Given this identity, which must hold, the trade deficit is equal to the excess of private sector investment minus savings, plus government spending minus tax revenue. So, the counterpart of the trade deficit is the sum of the private sector deficit and the government deficit (federal + state and local). The U.S. trade deficit, therefore, is just the mirror image of what is happening in the U.S. domestic economy. If expenditures in the U.S. exceed the incomes produced, which they do, the excess expenditures will be met by an excess of imports over exports (read: a trade deficit). This is simply math. Since Americans collectively consume more than they produce or invest, the difference must come from somewhere besides thin air. (Borrowing the money doesn’t help because the borrowed money itself has to come from savings.) The only way to solve the equation is to import the excess consumption, i.e. run a trade deficit. Furthermore, the trade deficit needs an equal and offsetting current account surplus. You as an individual have to get your money that you spent from somewhere. It works the same for countries. That means foreigners have to buy things in the US, like real estate or stocks, or US companies invest their money outside of the US and bring the profits back into the US. This makes the trade deficit equal the current account surplus. Or, there are ways government could encourage lower consumption and higher savings, but they would mean a dramatic lifestyle change for many, if not most Americans. We would have to become more like Japan, for instance, where people tend to save more of their earnings and live more frugally. Since, as we know, millions of Americans have little excess income to save and already lead pretty frugal lives, it’s hard to see any such change happening, at least anytime soon. So math says we will run a trade deficit with somebody. 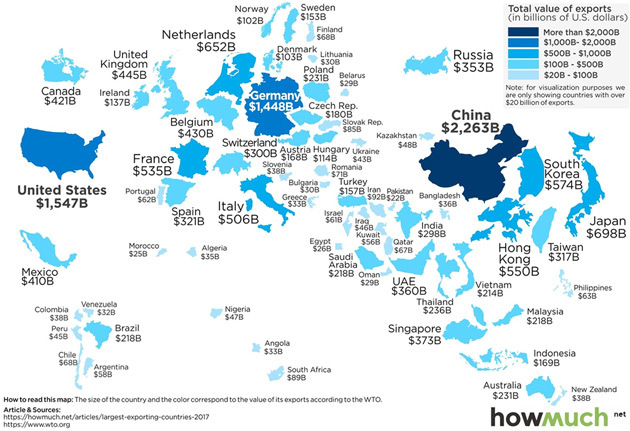 It doesn’t necessarily have to be China, but our economy is not suited to be a net exporter. We can buy our T-shirts from Vietnam or Pakistan instead of China, but it is still a trade deficit. Why can’t we make T-shirts in the US? Because they will cost more, which means consumers will buy fewer, which means a smaller economy with fewer jobs. I know it is counterintuitive but that is just the reality of a world that Ricardo described. But running a trade deficit, when you can get away with it, also has advantages. It’s the reason the US dollar is the world’s reserve currency. We ship enormous quantities of greenbacks overseas to pay for all the stuff we import. Our trade partners have to accept them (as opposed to some other currency) because the US is such a large customer. We carry the big stick. Better yet, all those dollars eventually come back home because they are of limited use to the foreigners upon which we force them. Chinese investors use them to buy our Treasury bonds or other purchases. The money flows to other countries and companies and eventually back to the US. Their added demand lets our Treasury borrow at lower rates than it otherwise could. In effect, the trade deficit subsidizes our government debt (which is too high but that’s another subject). So we see trade deficits aren’t necessarily bad, but that’s not all. Even if we wanted to get rid of the trade deficit, it’s not clear we could—at least without creating some serious side effects. Martin Wolf said it well in the Financial Times last week. Serious economists, back to Adam Smith, would insist that seeking a surplus with every trading partner is not “winning.” It is absurd. This is not even intelligent mercantilism, which would focus on the overall balance. Yet, particularly with free capital flows, overall balance is a foolish goal and one that trade policy cannot achieve. It is incredible that such primitive ideas rule the most sophisticated country on earth. Martin’s point is well taken. Whether a country’s balance of trade is helpful depends highly on the circumstances. They aren’t automatically good or bad. The US trade deficit is helpful, as I’ve described, but in Greece a few years ago it was disastrous. The internal trade deficit southern eurozone countries ran with Germany (and other highly productive European countries) let them run up massive government, personal, and corporate debt, which they couldn’t pay. Greece was just the first and Italy is lining up to be the next. In a normal world, when Greece used the drachma, the currency valuation would have fallen and made Greek citizens demand fewer imports. What actually happened was all the debt became due, forcing massive austerity in a kind of shadow devaluation. It was simply brutal. Germany’s corresponding trade surplus with other EU countries is not necessarily great, either. Notice that in the chart below, Germany is the world’s third-largest exporter. It could not do with a strong currency like the Swiss franc. It works only because it is in the eurozone with weaker economies. A Volkswagen or Mercedes-Benz valued in deutsche marks that cost 50% more wouldn’t compete very well on a global scale. Germany will learn that the hard way before this is all over. One oddity of all this is that the same people who want to reduce the trade deficit often worry about the dollar losing its reserve status. That may well happen anyway in some far-off distant future, but making the trade deficit smaller will only accelerate it. The simple matter is that by agreeing to be the world’s reserve currency, and by essentially making the Federal Reserve the world’s central bank, we have agreed to supply dollars to the rest of the world so that they can trade with them. The US has done a remarkable job of running trade deficits and supplying those dollars. It is what my friend Paul McCulley calls being “responsibly irresponsible.” If we didn’t provide those dollars, the world would find another currency to trade in, and the US would lose the exorbitant privilege and its benefits. We already see the early stages of this process. Between the relatively small tariffs that are already in effect and fear of more to come, the US dollar has been tearing higher against other currencies. (The Fed’s tightening policy has something to do with it, too.) This is just supply and demand. The supply of dollars outside the US is shrinking, making each one more valuable. The consequences aren’t good for the US. For one, a stronger dollar makes US exports more expensive and encourages foreigners to seek alternatives to American goods. That’s the case even without the retaliatory tariffs foreign governments are placing on many US exports. Worse, the stronger dollar penalizes every US exporter, not just those unlucky enough to get hit by tariffs. The other consequence is even scarier. Foreign governments and corporations, particularly those in emerging market countries, owe trillions in dollar-denominated debt. The rising dollar is making it more expensive to repay those debts. Governments and central banks are taking heroic measures to help but can only do so much. Eventually, some will default. Then we will have an old-fashioned currency crisis in a world far more interconnected and leveraged than it was in 1998. Exactly how that will unfold, or when, is unclear. But there is the real possibility that it can happen. The genie is out of the bottle and swirling around, deciding where to strike. We’re going to get what we wished for and we are not going to like it. The endgame, as I’ve written, will be The Great Reset where the debt of governments all over the world, plus all their unfunded government liabilities and promised pensions and healthcare, is going to be “resolved,” and unfortunately it will happen in the middle of a crisis. Last week’s deal to revise and rename NAFTA, while positive, is being wrongly spun as reduced trade tension. I don’t see it that way at all. The new agreement still needs legislative approval in all three countries which may not be forthcoming. Opposition forces are already springing into action, now that they have an actual text to attack. But the bigger problem is that this clears the way for Trump to concentrate fire on China. If you recall, my Camp Kotok sources said the NAFTA revisions, once complete, would let Trump pivot to China and try to force Beijing into a deal before the midterm elections. That appears to be what is happening. Gavekal’s Arthur Kroeber pointed out in a bulletin this week (which Over My Shoulder members can read here) “the forces pawing the ground for a fight with China are far stronger, and the reins on them far weaker, than was the case in the NAFTA and trans-Atlantic scuffles.” He also points out that US businesses with China exposure are caught in the middle and not trying to fight the White House on this. Kroeber also highlighted this Axios report that the Trump administration is planning a major broadside against China in the next few weeks. That means the relief markets are presently feeling may not last long. Speaking of Gavekal, I have to say their research has been one of my best resources for years for staying on top of all this. No one knows Asia like the Gavekal team. Each morning I get an e-mail or two or three with all their firm’s latest research on the world economy, China, currencies, central banks, interest rates, and more. It is astonishingly useful. I wish I could share it all with you, but it’s a very expensive service intended for institutions and family offices. However, I do share some of Gavekal’s best analysis with Over My Shoulder members. Lately, they’ve sent so much great info I asked Louis if we could hold a special “Gavekal Week” and feature their material every day. He graciously agreed and we are doing it next week, Oct. 8-12. For instance, on Monday Over My Shoulder members will get the Gavekal Dragonomics China Inc. Annual Report 2018. This amazing chartbook outlines key trends in China’s corporate sector. It digs into differences between state-owned enterprises and private listed companies, drilling down to the sector level to show different impacts of the trade war and other policies. It’s invaluable if you want to understand what is really happening in China. You can get the chartbook and the rest of Gavekal Week just by trying Over My Shoulder at a special $9.95 monthly rate. That’s 33% off and you can get it just by joining before Oct. 8. After that, the price will go back up to $14.95 so don’t miss out. If you find it’s not for you, you can cancel any time and still keep the valuable Gavekal Week resources. Learn more and sign up here. Sometime in the next few weeks I have to go to Toronto for a day, where I hope to also meet former BIS chief economist Bill White and a few other friends for dinner. Then in early November I will go to Frankfurt for a conference. Shane and I also intend to get to Puerto Rico sometime over the next month or so. And there was my 69th birthday this last week. A little personal humor from my life. I got an email from AT&T saying they were going to cancel my account. I had no idea which account. Since I don’t generally handle these things, I sent it on to the powers that be (Shane) and she determined it was my internet connection, which we just installed recently. There was some problem with the automatic billing. We called AT&T and they wanted to know our password. I didn’t know it. So they gave me a clue. I swear to God, they asked who was my favorite childhood hero. I started guessing. Davy Crockett? The Lone Ranger? Roy Rogers? Tom Swift? I went through a long list and was told “no” to each one. In our catch-22 situation, we could not go online without knowing that particular password to change our other password. Shane finally guessed her numeric password and that was a winner. My childhood hero? My mother’s maiden name, my best friend growing up, my favorite pet, and a host of the other usual questions would all be on the tip of my tongue, but not that one. Who makes this stuff up? My assistant Tammi, after she could get in the account, checked every other password question trying to figure out where they came up with that. We still have no clue. And with that, I will hit the send button, hoping that the AT&T bureaucrats aren’t from the same mold as those running the international credit system. That would make me tremble. Have a great week!